This past week, I’ve started to upload preview photos for the art therapy photo documentary project Spaces & Places: Where We Create. It has been very inspiring to see and learn about the creative spaces of the project’s endorsers who are offering a sneak peek into their work, spaces, and favorite tools of the trade. I am looking forward to learning even more from future submissions when Spaces & Places: Where We Create officially launches to the art therapy community on February 13. These series of photos (above) show my creative space and office used for my own art-making, art therapy supervision, and small group art meet ups with friends & colleagues. The space is packed with my favorite art supplies (for collage, art journaling, altered art & bookmaking, painting, & drawing), inspiring photos, art, notes, toys, books, and more. Part of my work at DVCAC includes providing community based art therapy to youth exposed to domestic violence through individual or support group services. I also offer individual and group art therapy to youth and women who come to shelter to escape domestic violence. 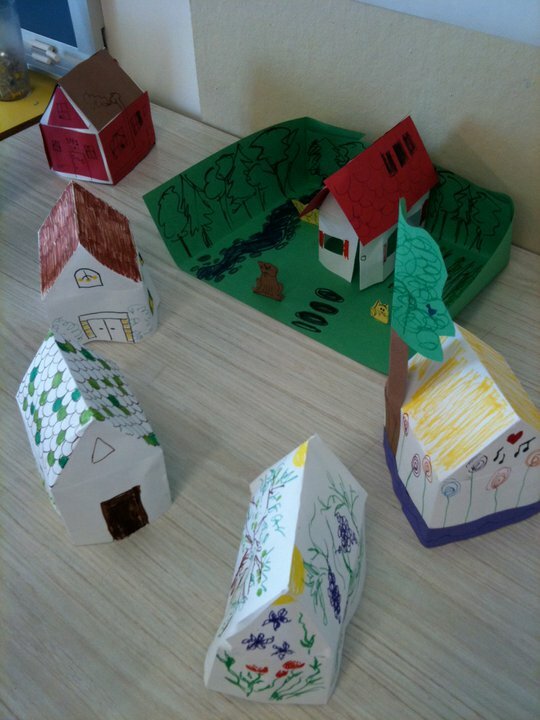 As seen in previous posts here, I often use Paper House Making to explore and address safety planning, safe places, and to help contain overwhelming feelings associated with the worry, fear, and terror that children and adolescents from violent homes experience. 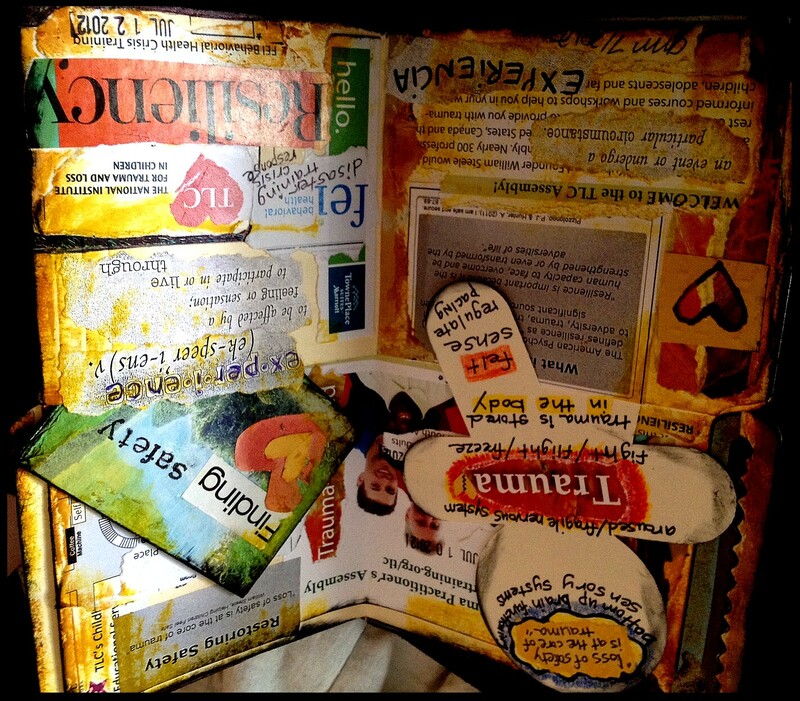 Another photo I included is a material pic connected an art journaling group I recently started for women in shelter as a non-threatening space and means to manage traumatic stress and strengthen coping. 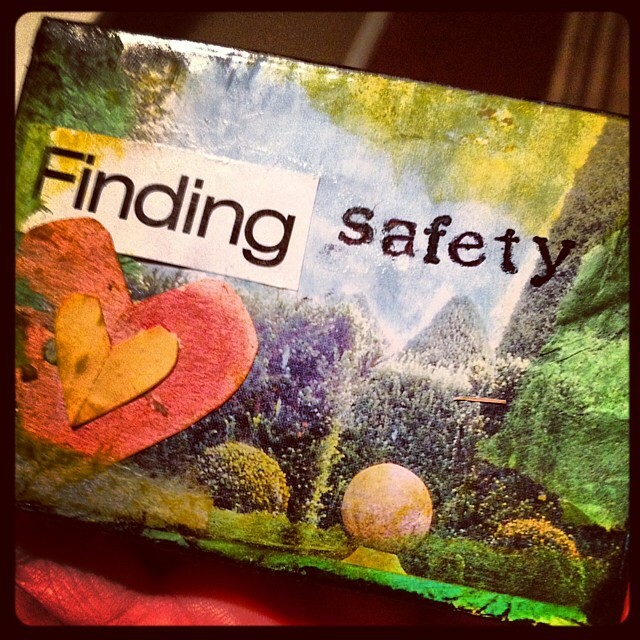 If you are interested in checking out the other photos that have been submitted so far (or future photos), check out the Art Therapy Alliance’s Set on Flickr for the project or follow photos via the Art Therapy Alliance’s Facebook page. When I started working in the social services field over 15 years ago, my first job was as a residential care youth worker. The unit I worked on included 10 pre-adolescent boys struggling with severe emotional and behavioral needs as a result of abuse, early childhood abandonment, and neglect. One of my first memories of beginning this new adventure was introducing purposeful and structured group time focused on general art making for relaxation, positive interaction, and self-expression. The programming was well received by the boys, my co-workers, and agency administrators, so much that they wanted more. This setting is eventually where I was fortunate enough to start my art therapy career, have the opportunity to develop the agency’s first art therapy program, and start to better understand some of the benefits and challenges related to group work within a partial hospitalization program. Fast forward about nine years later when I transitioned from the residential treatment setting to work in a shelter with youth impacted by domestic violence, as well as work within a bereavement program with grieving children and teens, where I started to learn more about and become better skilled at trauma informed group work. A lot of this experience was obtained through great support and supervisors I was lucky enough to have in these settings, as well as the commitment I made to become certified as a Trauma Specialist and Consultant through The National Institute for Trauma and Loss in Children (TLC). I am very grateful that during the last eight years I have been able to serve and focus most of my art therapy work on trauma informed groups for helping at-risk children and adolescents, whether this includes youth in crisis from exposure to domestic violence, adolescents in foster care, children and teens in shelter coping with homelessness, or grieving youth who have experienced traumatic death loss. Inspired by this journey, I am excited to announce my new online course , Group Strategies & Interventions with Traumatized Children and Adolescents being offered through TLC. My course focuses on the benefits and considerations important to facilitating group work with traumatized youth and introduces participants to themes, sensory based activities, therapeutic books, games, and creative interventions to implement in the group setting with traumatized youth. To learn more and register, check out information about the course here. 6.0 Continuing Education Units (CEUs) are available. The National Institute for Trauma and Loss in Children (TLC) announced this week that Art and Play Therapists can receive a reduced rate to attend this year’s Childhood Trauma Practitioner’s Assembly in July. Jeffery Georgi (this year’s keynote) will be presenting on The Adolescent Brain, as well as other presenters offering best practices in trauma informed work with children and adolescents. Check out the details below and visit this page to register with the discounted rate. Engage in activities and experientials to enhance your awareness and insight about the benefits of using hands-on and creative interventions in group work with traumatized youth. It’s official! I’ll be blogging as a core contributor for The Trauma Network, a growing community of therapists coming together to learn new ways to advance their clinical practice, exchange resources, interventions, and find support related to trauma informed work. My posts for the network will focus on considerations, strategies, best practices, and ideas for therapists working with children, adolescents, families, and women impacted by domestic violence, including the benefits of using art and creative interventions with this population. I hope my blogging will start a dialogue and create a trauma informed resource within this community connected to domestic violence and offer practical information useful for this area of work. 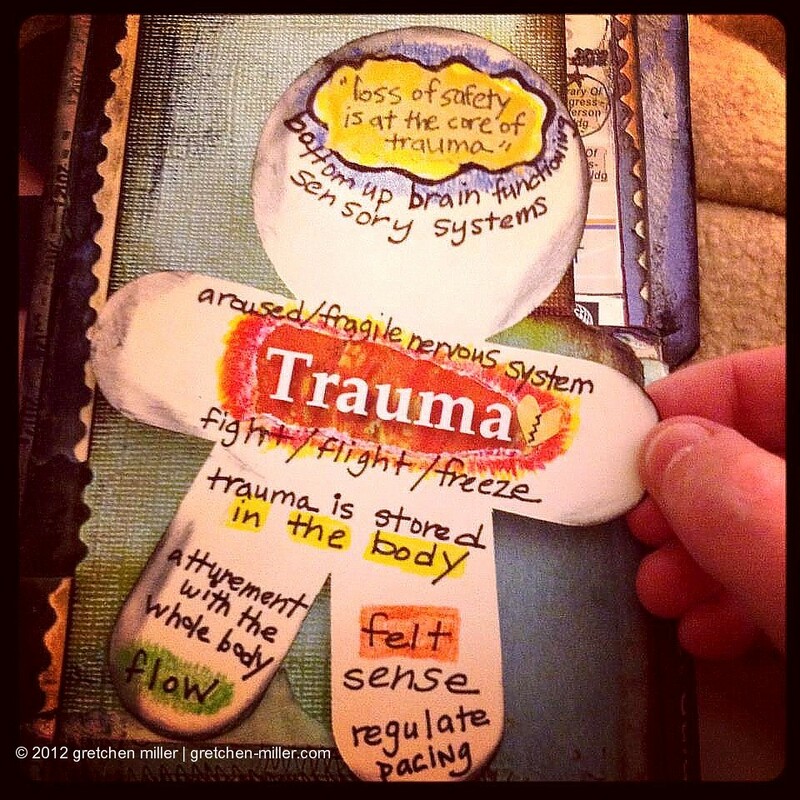 To learn more about The Trauma Network and how to join (free! ), please visit http://www.thetraumanetwork.com. 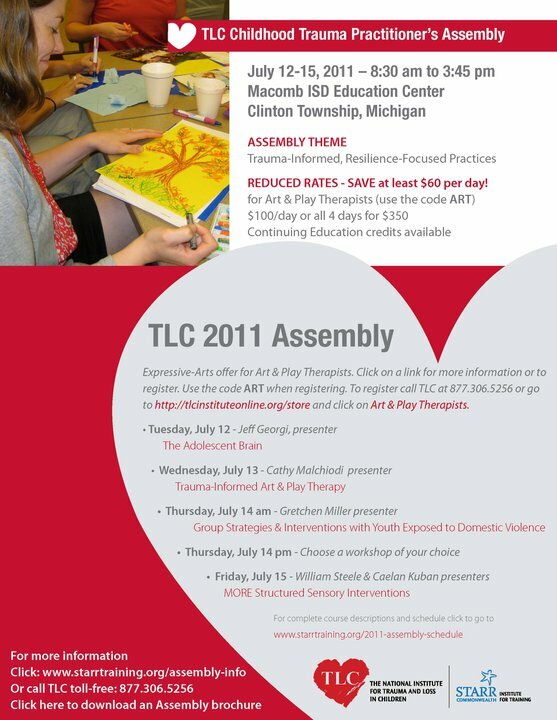 Registration is now open for TLC’s Childhood Trauma Practitioner’s Assembly being held this summer July 12-15, 2011 in Clinton Township, Michigan. I’ve attended this enriching and quality trauma conference for several years now and have learned so much from TLC about how to incorporate a more trauma informed approach in my art therapy work with traumatized and grieving youth. Check out these past posts from the Assembly in 2010 and 2009 to read more about my experiences. This year’s theme is Trauma-Informed Resilience-Focused Practices and will introduce participants to interventions, programs, tools, and best practices to best help traumatized children. In addition to the Assembly’s keynote featuring Jeffrey M. Georgi, who will be presenting on The Adolescent Brain the program schedule also includes daily workshops and courses for trauma certification. I am honored to be included as a workshop presenter for this year’s program. On Thursday, July 14 I will be presenting a morning workshop about group strategies and interventions with youth exposed to domestic violence. This workshop will focus on strategies and interventions important to facilitating group work with children and adolescents who have been impacted by domestic violence. Participants will learn practical tools and important themes to consider when working with youth exposed to domestic violence, including the introduction of activities that incorporate sensory-based intervention, therapeutic books, and art expression. Content presented will help participants gain a trauma informed understanding about how these strategies and interventions promote safety, emotional expression, coping, validation, and normalizing related to working with youth from violent homes. Participants will also engage in activities and experientials to enhance their awareness and insight about the benefits of using hands-on and creative interventions in group work with traumatized youth. To learn more, visit the Assembly’s information page. 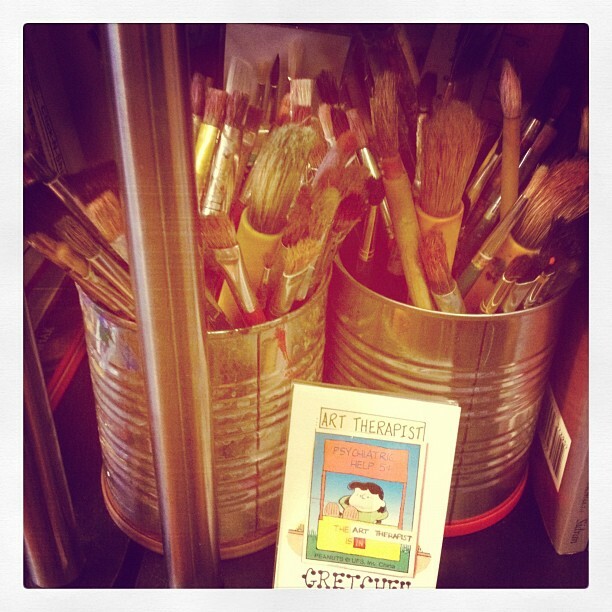 TLC is also offering Art and Play Therapists a reduced registration fee. Check out this page to register using the discounted rate. This week-end I attended Trauma, Recovery, & Growth: Art Therapy & Other Therapeutic Approaches hosted by Seton Hill University, the Graduate Art Therapy Program, and the program’s Student Art Therapy Association. I had the pleasure to present an afternoon workshop focusing on strategies and important themes to consider when facilitating group work with youth exposed to domestic violence. 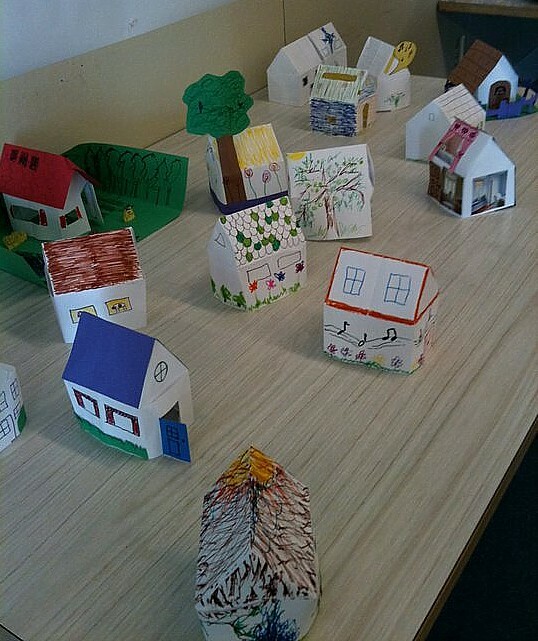 Part of the workshop included a hands on art experiential where participants were introduced to making paper houses and encouraged to think about and create what makes a house a home & safe. Exploring issues around home in the context of safety planning, safe places, and helping to contain overwhelming feelings associated with worry and fear are important for children and adolescents from violent homes and have been impacted by the terror of domestic violence in their daily lives. The PDF below includes information and a visual how-to about creating a three dimensional house from a 8 1/2 x 11 piece of paper and some simple paperfolding steps. Art expression in trauma intervention can create a safe, welcoming, and non-threatening environment that can support traumatized youth in sharing their story through the creative process and artmaking. 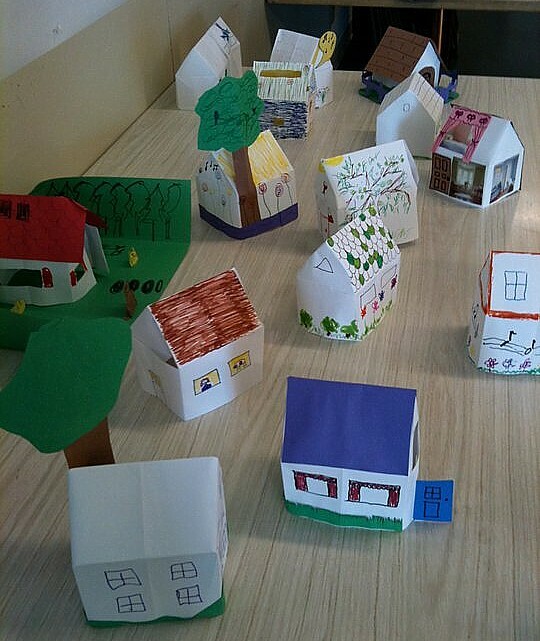 This paper house intervention and the process of paperfolding combines mindfulness elements with the structure of containment to help youth feel safe and explore experiences rooted in trauma and loss through art. 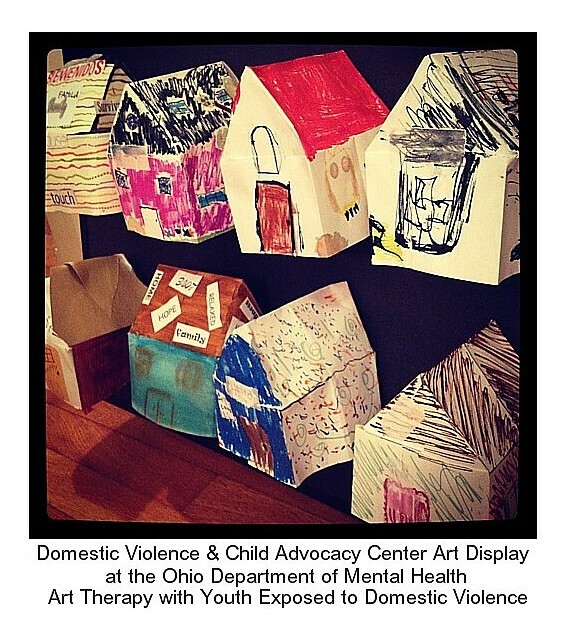 If you are interested in learning more about art therapy with youth impacted by domestic violence, check out some of my presentations here. 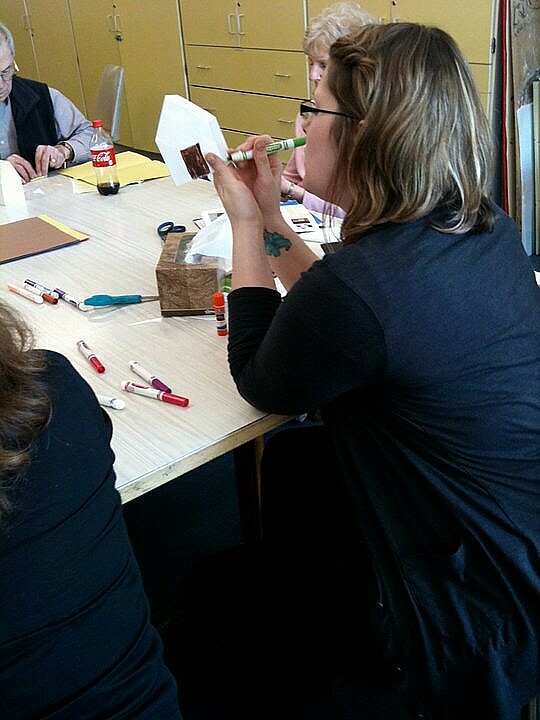 Thanks to Seton Hill’s Graduate Art Therapy Program and Student Art Therapy Association for an awesome conference! This one-day conference at Seton Hill University features a 3 hour keynote workshop presented by Linda Gantt on Using the Graphic Narrative for Trauma Processing, in addition to other trauma focused offerings addressing attachment and mind/body approaches through art, music, dance, and movement therapy. I am looking forward to being part of this program through presenting an afternoon workshop about Art Therapy Group Strategies and Interventions with Youth Exposed to Domestic Violence. This presentation will focus on strategies and important themes to consider when facilitating group work with youth exposed to domestic violence. Content presented will help participants gain a trauma informed understanding related to safety, emotional expression, coping, validation, and normalizing through art expression in a group setting for this population. 6.5 continuing education credits are available for this full day conference. If you are interested in learning more and how to register, download the brochure and registration information here.